Instant Pot Spaghetti and Meatballs [Soccer Mom] is the viral recipe, which started the craze of frozen meatballs and premade spaghetti sauce for a quick meal. Before you call me a hypocrite, here’s my disclosure. I don’t like any kind of meat with my spaghetti and I prefer homemade ingredients, like sauce and meatballs. 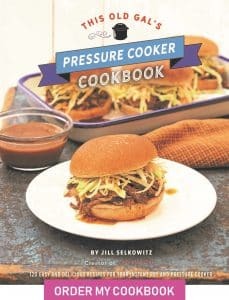 Here’s the sitch, many of my readers do like meat with their Spaghetti and love my homemade Pressure Cooker Beef and Macaroni and my homemade Pressure Cooker Quick One Pot Spaghetti Dinner. However, they have asked me to post directions on how to make a really quick and delicious Spaghetti Dinner. Many moms and dads are very busy driving their kids all over the place and need to be able to run into the house, toss a few things in their Pressure Cooker, get the kids situated and sit them down to a good and hearty meal. All that in a very short amount of time and with little to no effort. 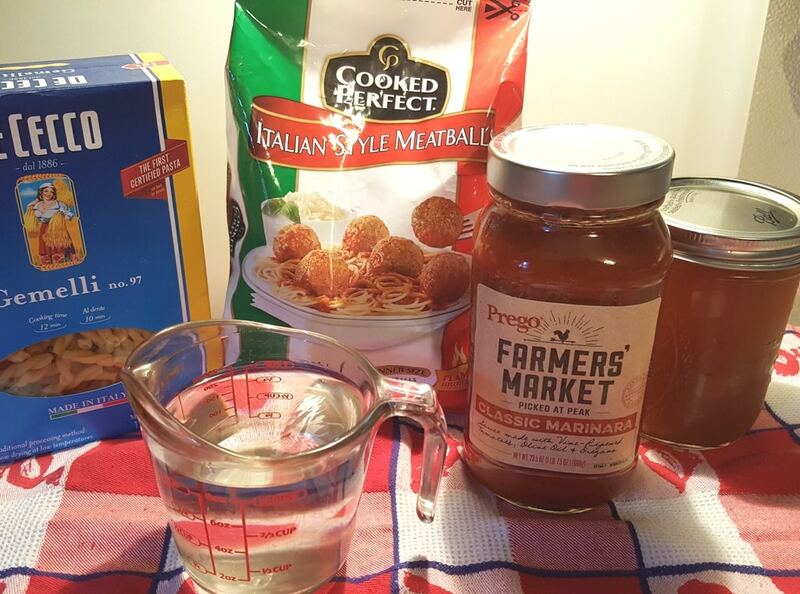 So, using my Pressure Cooker, I will show you how to make Instant Pot Soccer Mom Spaghetti and Meatballs, with all store bought, packaged ingredients and have it on the table in less than 15 minutes. Use Beef or Turkey Meatballs. Make it vegetarian and use Gardein Classic Meatless Meatballs. The ingredients are simple and few. I’ve said this before and I think it is worth repeating. Frozen Meatballs – any brand. If you have fresh meatballs, they work too and if you made homemade and froze them, even better. Spaghetti Sauce – I really like this Rao brand very much! Just Take Me To the Best Instant Pot Spaghetti and Meatballs Recipe Ever! 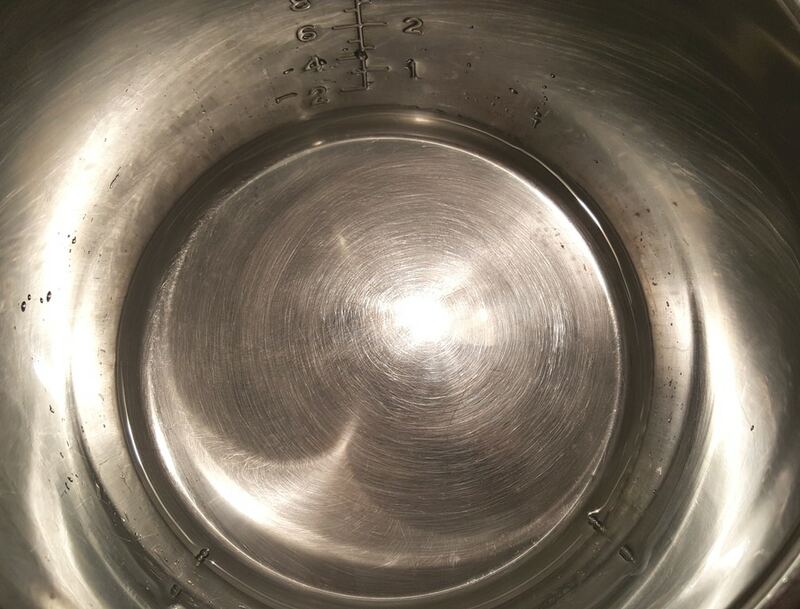 Add some water to the bottom of your Pressure Cooker cooking pot. As an aside, we have a boat load of Pressure Cooker Bone Broth/Stock in the freezer. I like to use my Pressure Cooker Bone Broth/Stock when making Spaghetti. However, since this is a recipe for people on the go, I’ll talk using just Fresh Water. After all, this is a Instant Pot Spaghetti and Meatballs for soccer moms, which means, this a quick meal, so, make it quick! If you want to use homemade Pressure Cooker Bone Broth/Stock or boxed Broth, I suggest low sodium. Jarred or canned sauce and frozen meatballs tend to have a higher sodium content. 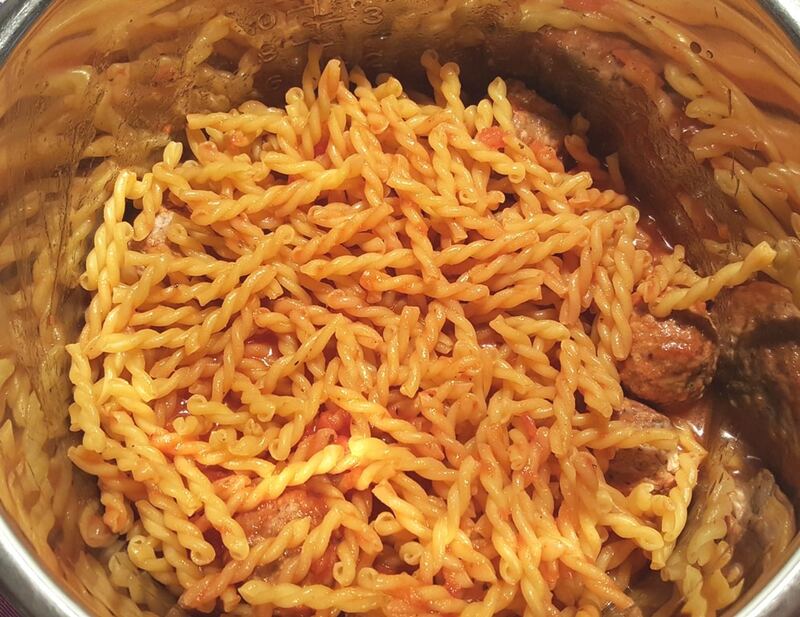 Toss in the entire bag of meatballs, assuming you are using a 16 oz box of Spaghetti. Alternatively, if you have frozen some of my famous Low Carb Margherita Pizza Meatballs, which are stuffed full of cheese, toss them in, instead of the bagged stuff. OMG, you guys, that is fantastic! A bite of gooey cheese in each delicious and tender meatball. Instant Pot Spaghetti and Meatballs recipe does not need to be layered. Sometimes store brands are as good as known brands and sometimes they are not. Like, if you are going to make one of my New York Cheesecakes, please, oh please, only buy Philadelphia Brand cream cheese. The store brands don’t taste near as good. In my opinion, De Cecco Brand Pasta holds up so much better than other brands of pasta in the Pressure Cooker. Plus, I prefer the taste and texture of De Cecco Brand Pasta. In the above photo, I am using De Cecco Gemelli Pasta, as opposed to De Cecco Spaghetti. There is a reason. I use Amazon Subscribe and Save for all my De Cecco Gemelli Pasta. I ran out of De Cecco Spaghetti. We love De Cecco Spaghetti in this house use it all time!!! I’ve also got an S&S for De Cecco Cavatappi. I love the cute shapes. I love the De Cecco Cavatappi for when I make Pressure Cooker Macaroni and Cheese. The cheese squishes out from inside the noodles. By the way, that is a quick dish too. I find the S&S significantly cheaper than buying the De Cecco Brand Pasta in the grocery stores. Check the prices, they are always changing on line and I grab a bunch when the price drops. The best jarred sauce we now love is Rao’s Homemade Marinara Sauce. 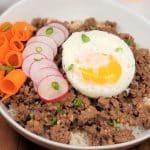 The taste is more similar to a homemade style and it is naturally lower in carbs and sugar, which is a huge plus for those following a low carb and/or keto diet. I prefer the Bertolli Organic Sauce or Rao’s Homemade Marinara Sauce. We keep a few jars in the cabinet and it’s most always the Rao’s Homemade Marinara Sauce. Once all ingredients are added to the Instant Pot DUO Plus, Mealthy MultiPot or Pressure Cooker, you are ready to pressure cook. That is it. Seriously, that’s it. How much time did that take? Grab meatballs out of the freezer, dump them in. Open a jar of Rao’s Homemade Marinara Sauce. Dump that in. Open a box of Spaghetti. Dump that in. It’s done. It looks great! There you go. Delicious and filling and most importantly, since this is called Pressure Cooker Soccer Mom Spaghetti and Meatballs, QUICK! It looks great! Drive those kids around knowing you can prepare a quick and easy meal. 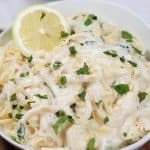 I love adding Fresh Grated Asiago Cheese to all my pasta dishes. I love the stuff. 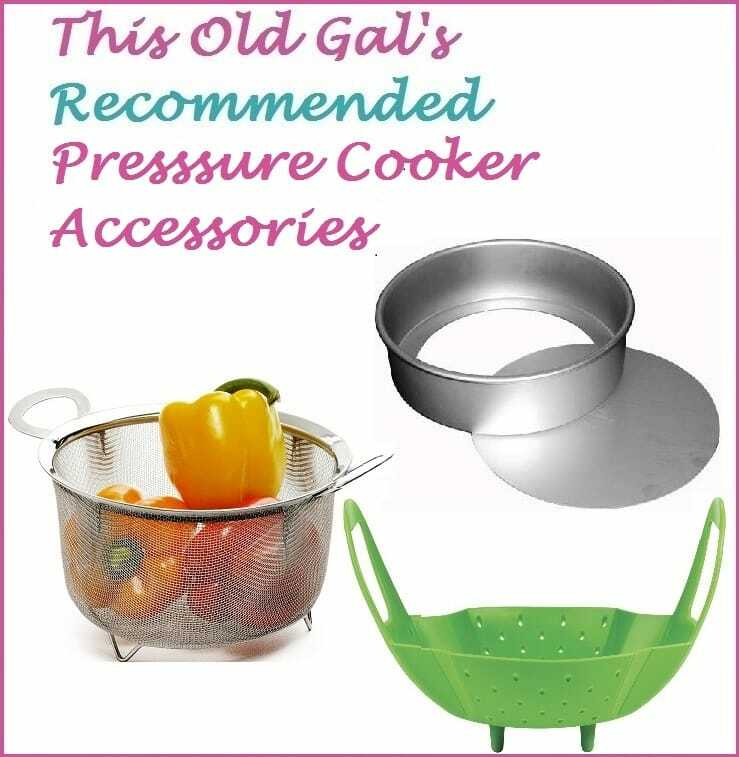 Alternatively, if you want to make this all homemade, check out my Pressure Cooker Beef and Macaroni, Pressure Cooker Quick One Pot Spaghetti Dinner and my Homemade Spaghetti Sauce recipes. I hope that this Pressure Cooker Soccer Mom Spaghetti and Meatballs recipe will save you lots of time in the kitchen and more time with your families. Ad meatballs to Instant Pot cooking pot. Add water, spaghetti (and sauce. When beep sounds, wait 5 minutes and then slowly release the rest of the pressure. Remove lid and mix together, breaking up any pasta, which has clumped together. 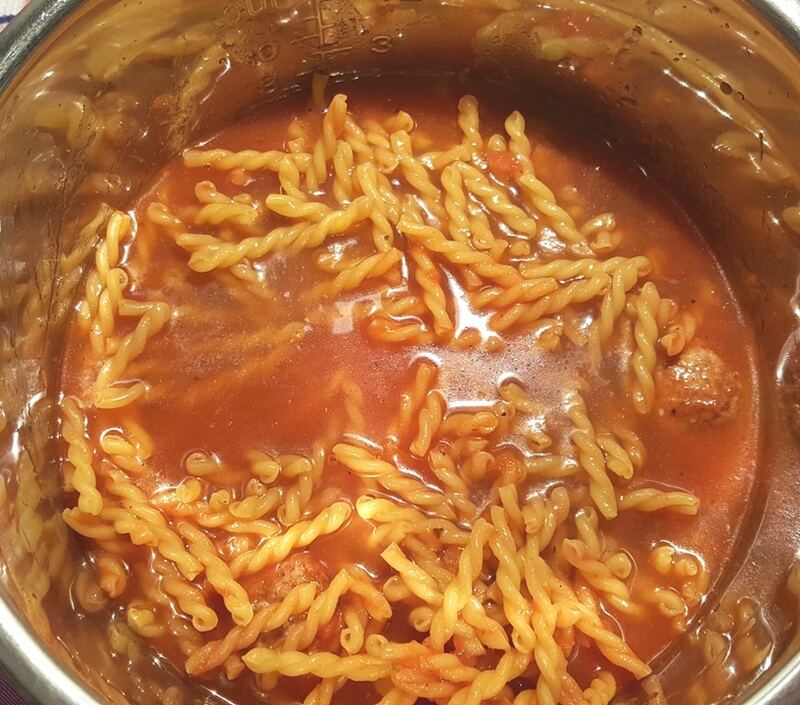 The noodles will continue to absorb the liquid and sauce. If there is excess liquid, simmer to reduce. If using Pasta, instead of traditional Spaghetti Noodles, set the Pressure Cooker time for 1/2 of the lower time indicated on the Pasta package and then subtract 2 minutes. 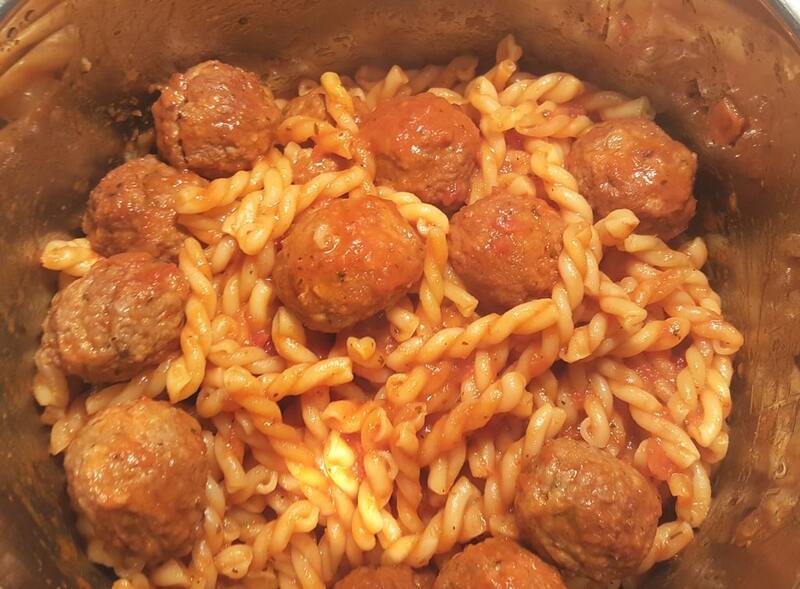 PIN this Pressure Cooker Soccer Mom Spaghetti and Meatballs! Not a basketball anymore, but this will come in very handy for a harvest meal for my farmer and me. Thanks! I made this last night. It was delicious and easy, but I don’t find this or many IP meals to be as quick as advertised because it seems to take 15 minutes or so just to come to pressure. Is that normal? I tried this recipe tonight, and realized that the recipe called for one jar of water and an additional 1/2 cup of water. I only added the 1/2 cup of water and no jar of water. How will this change the recipe in terms of taste?? I need to make two boxes of pasta at a time for six people, three of whom are teens and eat a ton. How much sauce and water should I use? Thanks. Any tips on how to halve this recipe as far as cooking time and liquid amounts go? Thanks! came out perfect made exactly as described with the better than bouillon instead of 24 oz broth. While easy and relatively tasty, this is not on the table in 15 minutes. I’ve done it three times now and the very least time to allow is 25 minutes. Those minutes are time that can be used to do something else, which is great, but 15 minutes is unrealistic. I am indeed doing other things while the IP comes to pressure and cooks, which is what I love about the pressure cooker! The preamble to the recipe, however, said that it is on the table in less than 15 minutes. My experience is that it takes longer than that. Cook time is one thing, on the table from preparation start is another. Not my intention to argue, but to be helpful to some who reads that and thinks that they will be serving dinner less than 15 minutes after they crack open a box of frozen meatballs. Thank you for the work involved in creating this easy and delicious recipe. Maybe you could make a salad and set the table. Seems like a whole meal in 25 minutes with one pot to clean when done is a winner. Since frozen meatballs are fully cooked, I suppose this could still translate well to homemade frozen versions… My meatballs are usually a little bigger- almost golf all size. Should I increase the time? 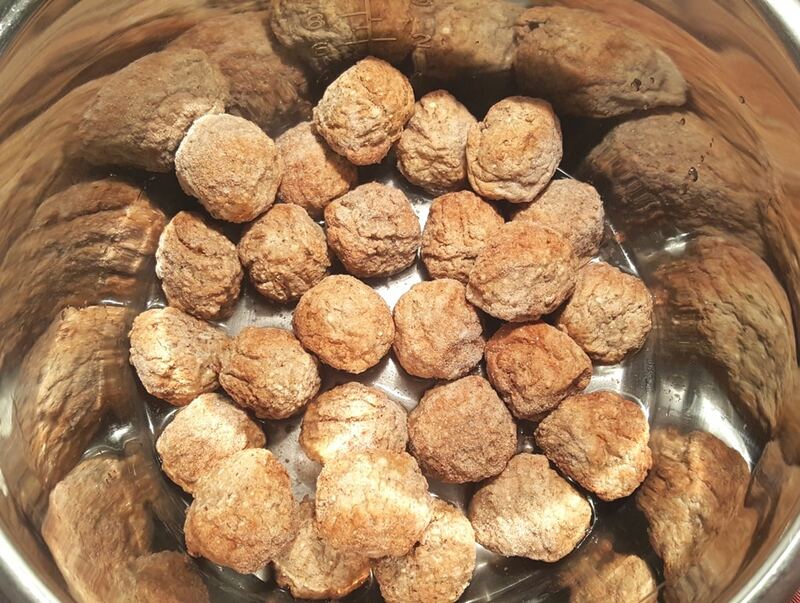 Since I make my own meatballs can you please tell us how many ounces in the bag of frozen meatballs that you use?Thanks! 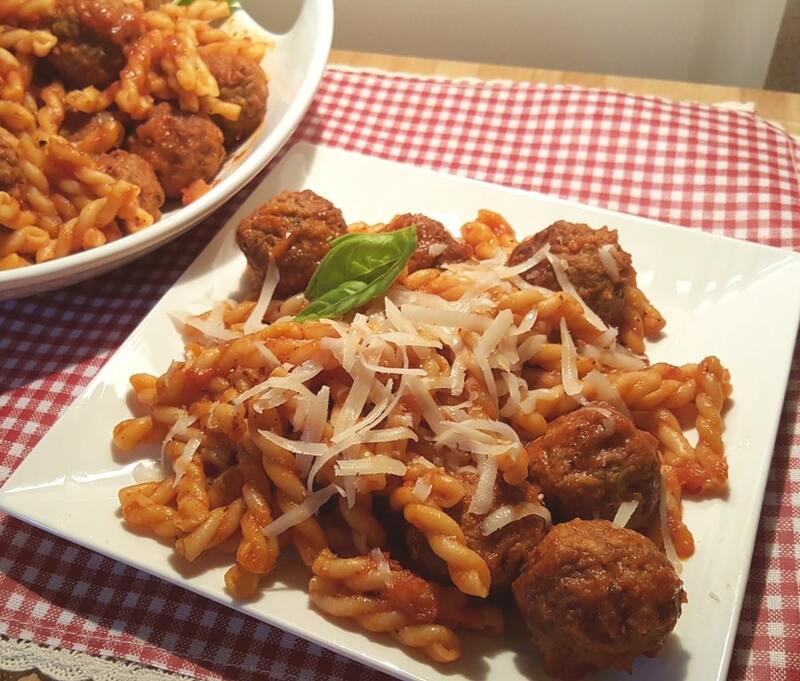 Hi is it possible to double this (2 pkg pasta, 2 sauce jars, 2 bags o’ meatballs? If so would I need to adjust the time? Love this so much. I had boxes of elbow, shell and mafalda pasta. So, I thought, Why Not. Cooked it all with chicken meatballs, for 6 min and a 5 min NPR. 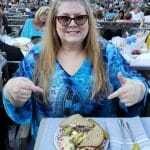 I have never seen my wife go back for seconds before, and we are in 47 years of married bliss! She loves it, it stays in our recipe box. Is the time the same for the long spaghetti style pasta? TYIA! Making this tonight and I’m so excited to be able to get it going after swim team and Work and still be able to empty the dishwasher and get the laundry changed while dinner works it’s magic in the IP. Thanks for the recipes and keep them coming! Can this be made with ground meat instead of the frozen meatballs? If I just wanted to do JUST the meatballs and sauce (for meatball subs) would you adapt anything (other than omitting pasta?) I definitely want to try but have a request for subs tonight! Thanks! I love the prego farmers market dsuce, it’s all we use! I see that using Swedish meatballs is better since when you place them in the sauce, they’ll move around easier and start pulling in more of the delicious flavor. Frozen meatballs were on sale today so I bought them and they say ‘Bite Size.’ How would I adjust the cooking times? I am using the gemelli for pasta. Also, the sauce sometimes seems a bit thin. How can I thicken up? Thank you! Wondering what size bag of frozen meatballs you used and what size box of spaghetti?? I sure would like an actual number of meatballs or ounces, because I have a giant bag from Sam’s and I’m pretty sure you don’t want me to use that whole thing! 24 oz of meatballs and 16 oz of pasta. Is the first 1/2 cup of water part of the jar of water or additional water? Thank you for your wonderful and informative website. 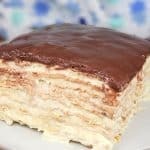 I’ve made several of your recipes and have never been disappointed! I think this depends on the amount of pasta – since I had a 12 oz. box of Penne Pasta I included the first 1/2 cup in the total. I took a chance and it came out OK but I would like more detail on the ratio. And I may have misread, but how do you add water to a 24 oz. jar of sauce until you’ve emptied the sauce first? Since the Penne Pasta cooking instructions called for 10 min. I cut it in half minus two and waited the five minutes before releasing pressure. Even though I was wondering if the pasta would be cooked enough the txture was perfect. Thanks. You answered my question about using 12 ounces of pasta. I would have also guessed the answer was to use less water. I read the directions the same as you did. My solution is to just use a measuring cup instead of the jar. I’ll try it tonight. Since the Penne Pasta cooking instructions called for 10 min. I cut it in half minus two and waited the five minutes before releasing pressure. Even though I was wondering if the pasta would be cooked enough the texture was perfect. This was a great, easy to make meal. I need dinners I can make in advance for my husband. I sautéed an onion, pepper and garlic first, then deglazed with some red wine and added some oregano and basil. I used rigatoni. You are a gift! You have not let me down yet. Love this recipe for my picky eaters who don’t like too much sauce. One question- what is the best way to add broccoli? When I make frozen meatballs on the stovetop, I like to brown them in a little oil and minced garlic. Gives them a little crust on the outside. Can I saute them in the IP first then add all the ingredients or will I be throwing the whole recipe into the garbage disposal? When I brown them stovetop, they do thaw out some but don’t heat thru. Help I’m a newbie! Can I substitute gluten free pasta? This was our first IP attempt after receiving one as a christmas gift. Measured everything directly into the pot using a kitchen scale and then let it go while we did dishes, set the table, made salad and threw garlic knots in the oven. Exactly 18 minutes later we sat down to this and it was so fantastic. Thank you for the recipe it was wonderful and we are thrilled with this appliance! This was soooo easy and soooo good! I added seasoning (red pepper flakes, black pepper, Italian seasoning, and garlic powder), and used pasta instead of spaghetti. 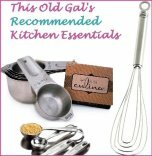 Thank you so much for all these tried and true recipes. I am going to make your yogurt this weekend. I eat a lot of yogurt, so this will be great. I will make your spaghetti tonight. Do you have a recipe for kefir? I have the grains. Thanks again. I love my IP. What did I do wrong? We are a small family, so I made 8oz of spaghetti and about 12 small frozen meatballs. I used half a jar of spaghetti sauce and about 1.5 cups water and a tablespoon of oil. My IP 6QT kept giving me the overheating error and noodles were burned onto the bottom of the pan. I kept having to add water until it made so many attempts to come to pressure that the noodles that didn’t burn cooked through anyway. What went wrong!?!? Do not stir as the recipe says. Layer only. Meatballs on bottom with water or broth, then noodles, then sauce. I got ‘Burn’ on my first try because I stirred before pressure cooking! Make sure you use the required measurements of ingredients also. Try again! This great! I have the 3 at. Instant Pot and am wondering if just cutting all the ingredients in half will work. How big is the bag of meatballs and box of spaghetti? Did you get an answer? I was wondering the same? If you’re using your frozen bone broth in place of some or all of the water, does it need to be thawed first? Yes, Defrost your broth first, or you can not pour it into the instant pot. just made this in my ip ….quick and easy…. Are the frozen meatballs precooked? I was wondering if it would work with fresh uncoooked meatballs my butcher sells. This recipe was excellent and super easy!! My modification was to add a small can of El Pato Mexican salsa with the spaghetti sauce. It adds such a wonderful layer of flavor that no one will be able to put their finger on to identify! Mom’s secret! Made this with turkey meatballs (frozen, fully cooked) and followed directions exactly. Turned out really nicely though next time I am going to try reducing the cooking time by 1 min so the pasta is less mushy. The whole pot got eaten! 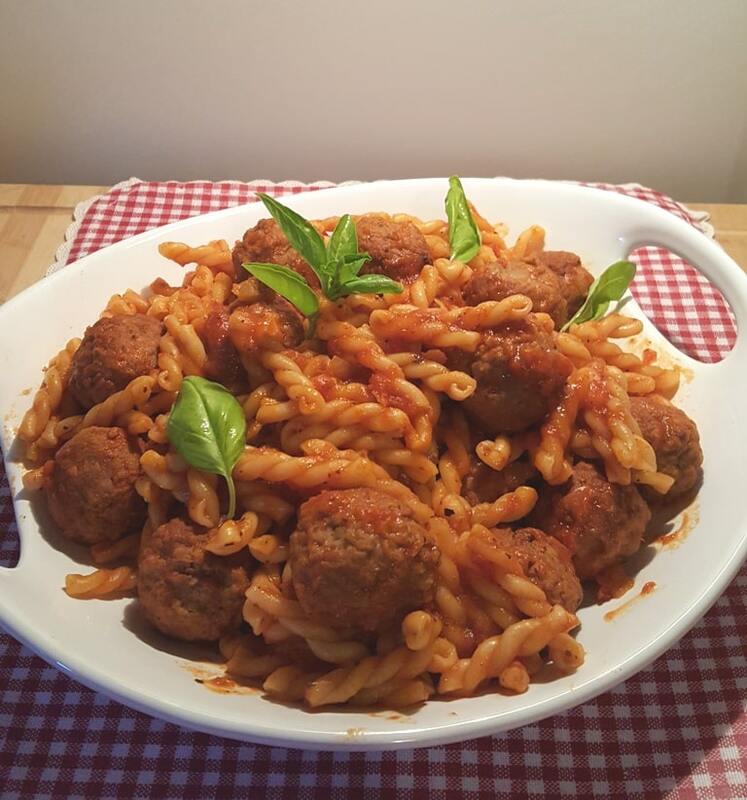 Finally a pasta & meatball success in the instant pot! yum in less time then to boil the pasta, thanks Jill! We LOVE the Pumpkin Chipotle sauce! Kind of reminds me of Chef Boyardee – only more grown up! Are the meatballs fully cooked already or raw? If I use frozen ground beef in this instead of meatballs, will it screw up the cooking time? 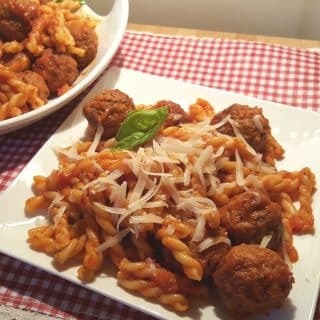 Please state the sizes used for the bag of meatballs and box of spaghetti directly in the recipe. This is a given when writing a recipe as sizes of products differ from state to state or country to country…not everyone wants to read the preamble to find out that information. I have made this recipe twice now, but guessed at the amount of pasta to use because I didn’t read the preamble. It still came out fine even though I only used 10 oz of pasta. Please adjust your online recipe to reflect the amounts required. Thank you! Hmmm, the amounts weren’t on the recipe card that I took a photo of 4 days ago! Hi. If I am making my own meatballs, should I cook them first or put them in raw? Thanks! 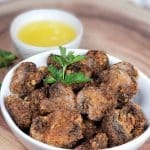 Had a friend recommend this recipe to me and it was absolutely delicious! I used a bag of frozen meatballs and about 22 minutes later it was up and running. I have a 6 QT instant pot so it filled it up quite a bit and so took a little longer to build up pressure but the pay off was well worth it! then put it on high pressure at 3 minutes…. I have the 8qt Instant Pot and am a first time user. Thanks! This recipe is a game changer for sure. I am in Australia, so I had to convert the measurements to metric, but it worked out perfectly! I added some garlic powder, dried basil, oregano and chilli flakes for an extra kick, and served with shaved Parmesan. I can’t believe how easy and delicious this meal is. I’d never purchased frozen meatballs before, but our supermarket started stocking them so I thought I’d try this recipe. So glad I did! I love being able to toss everything in and walk away. This made my night so much easier with our two young children needing my attention. I will definitely add this to our regular rotation, thank you! We did this tonight. I used my own meatball recipe, baked them, then froze them. This makes for faster italian nights. I put enough frozen meatballs in bottom of my instant pot for our family. Then I used thin spaghetti and broke in half and criss crossed it over the meatballs. Then I combined 24 ounces (3 cups) of spaghetti sauce (homemade) with 32 ounces (4 cups) chicken broth, and poured that over the noodles. Set it to manual for 8 minutes. Let natural release for 10 minutes, then quick release. Gave a good stir, and served with parmesan, cottage cheese, and rustic bread. Easy comfort food. Came out good. I like my pasta al dente so I would take a minute off next time for sure but was super quick and easy. Thanks! Making this for the second time. My son said this is the best spaghetti and meatballs he ever ate and he’s extremely fussy! It has a lot more taste than the traditionally made spaghetti and meatballs. I made it per the recipe except I added a little Italian seasoning. Was looking for something easy to make for dinner and found your recipe. Made it with the De Cecco Gemelli pasta and it was beyond delicious. This is going to become a regular in our meal rotation! Thank you for this recipe! The pasta I use comes in 12 oz. boxes. Should I make any adjustments to the recipe?